This guide focuses on history as a mode of thinking. It helps students come to understand that every historical perspective can be analyzed and assessed using the tools of critical thinking and it targets the cultivation of historical reasoning abilities and traits in student thought. 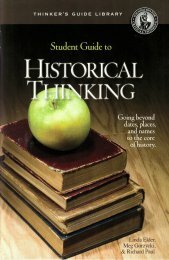 The Student Guide to Historical Thinking can be used along with historical tests and/or textbooks in instruction. An instructors guide to this student guide is currently available. The foundations of Critical Thinking are highlighted in both guides and contextualized for historical thought. The primary purpose of both is to illuminate history as a powerful system of understandings that can help students analyze the past in ways that help them live more reasonably in the present and future. I studied the book with great interest and eagerness to master its contents. This book could not have been written in a more relevant time. In other words, if this book did not exist, it had to be written at this time. Although it is geared toward thinking critically about history, its applications are far more general. This book could readily be adopted to alternative settings and be titled, for example, “Analyzing Contemporary World Events,” or “Understanding Mass Media,” or something similar. I read the book, “Historical Critical Thinking” with utmost interest and concentration. The book contains vast quantities of transferable knowledge applicable to myriad situations ranging from the demonstration of leadership in interpersonal affairs to analysis of contemporary world events. Particularly unique and appealing feature of this book is that it does not propose an “all or nothing” strategy toward improved understanding through critical thinking. Rather, each of the numerous precisely guided strategies could be applied in isolation while garnering all the intended benefits borne by the applied remedy. …I congratulate the authors of this book for exercising what they preach in the book. The writing style is concise and appropriate and so are their word choices. I have been going through the book quite often, as I find it very helpful - and insanely dense! Short, sweet, and to-the-point chapters are very nice to see in any instructional book, but I am impressed at how you (Foundation) have managed to organize everything so well. There is a very nice balance of text and graphics used, which is a very smart way to handle things. The "Asking Questions" prompts I found very useful in understanding the book's ideas. And the Appendices at the end are actually highly functional - too many books of this kind would have made three separate chapters out of those three appendices, and surrounded that with a ton of fluff. I see this as a model of how all textbooks and instructional material should be put together: concise, helpful, and complete, without pandering to the "For Dummies" trend of reducing everything to "tips and tricks". This book punches well above its weight - great job! Everyone thinks about the past, but few people think critically about how they have come to think about the past. Most of us do not recognize that the stories we tell ourselves about the past are examples of historical thinking. What is more, these stories are often riddled with distortions of our own making. Our view of the past is largely prejudiced by the ideologies of the cultures and groups that have influenced us. We see the past through the lenses we have created in our own minds. We want to see the past in a certain way, so we do. We have been taught to see the past in a certain way, so we see it that way. We rarely question the cultural norms, customs, beliefs, taboos, and values that influence our conceptualizations of history. If we are to create fairminded and critical societies, societies in which all peoples, nations, and cultures come to value fairminded critical thinking, we will need to think critically about history. We will need to see the past in ways that are less biased. We will need to use our understanding of the past to help us make better decisions in the present and future. ... Too many times we read history as fact, and your focus on evaluating how the author has interpreted history is much appreciated. One of the strengths of your document is that, while focused on history students, it is useful for anyone who applies historical knowledge in their work. I like how you encourage questioning of the author's point of view, as there are typically several different perspectives on the same topic. This is very relevant to my students, who generally are receiving information second or third hand at best. Even more important, I appreciate how you stress that history is more than just a listing of names, dates, and places. By memorizing only these details, we lose the insights from a "system of interconnected ideas." I try to convey this to my students, and Historical Thinking will be a great resource.